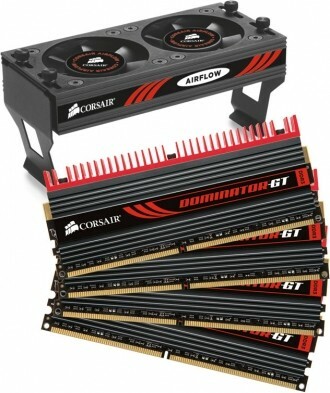 Corsair has announced multiple quad channel DDR3 memory kits designed for use on Intel’s new Sandy Bridge-E platform. 32nm, socket LGA-2011 processors feature an upgraded integrated memory controller with four channels supporting DDR3-1600 memory for a theoretical peak bandwidth of 51.2GB/s. Corsair is offering multiple quad channel kit sizes under various product lines. In terms of sheer operating speed, the 8GB Dominator GT package is rated at PC3-19200 (2400MHz) at tested latencies of 10-12-10-27. A 32GB Dominator GT kit is also available, although these modules are only tested at 2133MHz with timings of 9-11-10-27. Standard Dominator and Vengeance kits are also available should you not require such high operating speeds. For example, the 32GB Vengeance kit operates at 1600MHz at 10-10-10-27. A low profile version of the Vengeance kit is offered in a 16GB capacity kit that features tighter tested timings of 8-8-8-24 at 1600MHz. Both Dominator and Dominator GT lines support Dual-path Heat eXchange (DHX), Corsair’s patented memory cooling technology. DHX Pro takes it one step further by including circuitry to measure various memory parameters which can then be output to a diagnostic device like the AirFlow Pro Memory parametric display. Pricing varies depending on which kit and capacity you are interested in. As of writing, a 32GB Dominator GT quad channel kit is listed at $261.35 on Corsair's website which seems to be in error as the kit is listed at $999 in Corsair's press release. A 32GB Vengeance kit with a slower speed rating costs $527.65.